I spend most of my week working on my own. I think that this is one of the main challenges for any kind of freelancer, at times it can become quite tedious and boring. To get over this I tend to listen to music or watch tv progams on my second screen. 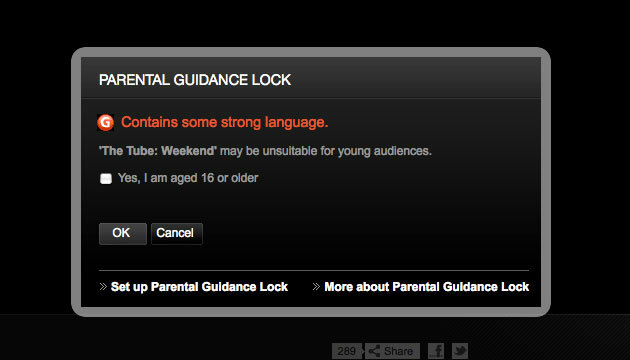 The parental controls on the iplayer make me laugh. Is there really any point to having them on there? It’s not something I know much about, but I do know that if I wasn’t 16 and I wanted to watch the program I would still click the box. It seems a bit pointless. This entry was posted on Wednesday, February 22nd, 2012 at 1:38 pm	and is filed under Recktangle News. You can follow any responses to this entry through the RSS 2.0 feed. You can leave a response, or trackback from your own site.